BagcraftPapercon offers the broadest range of specialty bag, sheet and roll converting capabilities in the flexible foodservice packaging industry. We manufacture high-quality custom packages on 125 different production lines to provide a wide variety of custom package and print designs. With our efficient, superior F&K presses, we can deliver state-of-the-art graphics capabilities that help differentiate your products on the shelf and on the go. Food processors have a wide range of needs and their packaging suppliers must have a history of consistent service, technical experience, and “out of the box” solutions. Our National account managers and local territory managers are experienced food packaging consultants that will deliver the service and value your operation needs to succeed in a competitive marketplace. Need a solution that provides a upscale “artisan” look to help you differentiate your food product from the institutional look of poly-film packaging? Our paper/poly window roll stock provides excellent formed package performance in the freezer, during the thaw period, microwave heating and conventional oven heating. Ask your local representative about our unique window roll stock solutions today. When we combine a flexible paper/poly package with a paperboard support tray we offer a unique solution to improve loading speed, product protection, and customer convenience. This hot new packaging trend can help reduce costs, enhance product image, improve sustainability and drive impulse sales. 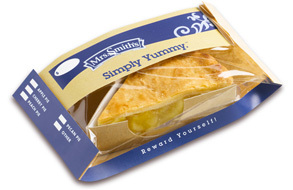 Our “package with tray” capabilities offer an easy way to differentiate your food product in an upscale way and avoid the institutional look of poly-wrapped packaging.